The premiere and last issues via ShelterPop. 1. It wasn't complicated. There's something to be said about the way living spaces were showcased in its pages. Of course there was a lot of styling involved to produce the beautiful photos that we all connected with month after month, but there was also an element of simplicity about them. The homes never gave off the impression of being overdone and I could often envision myself living in the very spaces I read about in every issue. 2. 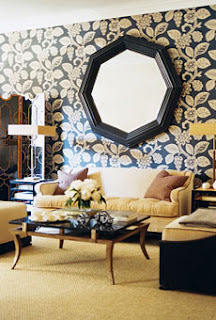 Trend coverage. The editors did a nice job of capturing home market trends, which is one of the main reasons people turn to design magazines. You want to know about those of-the-moment pieces, even if it's a trend that doesn't fully resonate with you. 3. The right dose of secondary content. In addition to stylish homes, there were often pages on beauty and fashion. This all made for a fun mix and, in my opinion, really helped to solidify the magazine as an expert. It demonstrates editorial strength when a magazine can delve into a subject that's not its main focus and still cover it in a way that seems to mesh well with its primary content. 4. Branding. 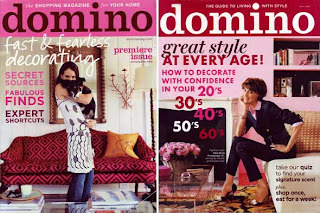 Beyond the print issues, I loved perusing the photos on the magazine's interactive website and was thrilled when it published Domino: The Book of Decorating (which, of course, has a permanent spot on my bookshelf). Brand extensions build reader loyalty and the magazine was definitely on track in this regard. 5. The Covers, the covers, the covers. Covers help to sell magazines and make you want to dig into an issue immediately. There's no denying that Domino's editors mastered the art of crafting great covers. From punchy coverlines to models who looked so happy and comfy in the homes in which they were photographed, the covers were always just right. Don't you just miss it? I sure do. And if you weren't aware, Brides.com carries some of Domino's images under its home section.